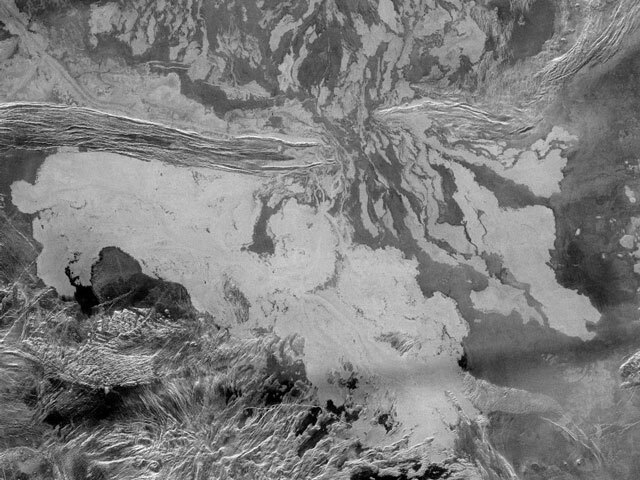 Explanation: The hot surface of Venus shows clear signs of ancient lava flows. Evidence of this was bolstered by the robot spacecraft Magellan, which orbited Venus in the early 1990s. Using imaging radar, Magellan was able to peer beneath the thick perpetual clouds that cover Earth's closest planetary neighbor. Picture above, lava apparently flowed down from the top of the image and pooled in the light colored areas visible across the image middle and bottom. The lava cut a channel across the darker ridge that runs horizontally across the image center. The picture covers about 500 kilometers across. The lava originates from a caldera named Ammavaru that lies about 300 kilometers off the image top. The hot dense climate makes Venus a more difficult planet on which to land spacecraft and rovers. Venus currently sparkles as the brightest object in the western sky after sunset.